This is the Double Crown worn by the rulers of a united Nile Valley. The red crown represents Lower Nile (Egypt) and the white crown represents Upper Nile (ancient Nubia). After the unification of the Upper and Lower Nile regions the two parts of the crown were joined to represent a unified Egypt. It is believed that Narmer (Menes) was the first recorded to wear the Double Crown. He was the founder of the First Dynasty around 3100 B.C. The Red (desher) crown symbolized life and victory. During celebrations, ancient Egyptians painted their bodies with red ochre and would wear amulets made of cornelian, a deep red stone. The white (hedj/shesep) crown suggests omnipotence and purity. The name of the holy city of Memphis meant "White Walls." White sandals were worn at holy ceremonies. The material most commonly used for ritual objects such as small ceremonial bowls and even the embalming table for the Apis Bulls in Memphis was white alabaster. 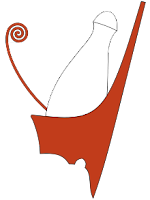 White was also the heraldic color of Upper Egypt. The "Nefer" crown of Upper Egypt was white. The pure white color used in Egyptian art was created from chalk and gypsum. The white crown appears like a linen turban and suggests purity. The red crown suggests the blood that purifies. The double crown association with Horus speaks of both purity and blood sacrifice. Among the ancient Afro-Asiatics these were linked as is evident from linguistic studies. The Double Crown was associated with Horus, the "son" of the Creator, because he united the peoples of the Upper and Lower Nile Valley. I've written here about how Horus was a pattern for Christ who unites two peoples into one Kingdom. The two peoples are those who lived in expectation of the appearing of the Seed promised in Genesis 3:15 and those who believe the testimony of the Apostles who saw His appearing. Just as the Patriarchs came to rule after taking their second wifes, so Christ will ascend the throne of the Father after He takes the Church as his bride. Exacators at Hierakonpolis report found "a series of New Kingdom inscriptions incised into the rock high up on the rise. These record the names of several priests with prayers and dedications to Horus of Nekhen depicted as a crouching falcon with the White or Double Crown on his head. The location of the inscriptions suggests that this spot had been chosen not only for the commanding view it provided, but because it marked the southeasternmost border of Hierakonpolis and would be the first place illuminated by the rays of the rising sun each morning." Susan Burns, an avid follower of Biblical Anthropology, has written: "The double axe symbol has been found at the Egyptian City of the Hawk signifying two lands. In this ancient city it is the Desheret symbol of sedge and bee. Desheret has been shown to have a root connection to Deborah, the Hebrew word for bee. Bee symbols are at the very heart of the afro-semitic language. Mn was the Egyptian god of the hive. The miraculous appearance of honey was attributed to him. Mn (with added Hebrew Heh) could be the Mannah (honeycomb) of Moses' Exodus sustaining the Israelites in the wilderness. I think it is interesting that the earliest Aramaic churches were hexagram shaped - a replica of a honeycomb cell." Abraham's people were Horites, a caste of priests ('Apiru/Habiru/Hebrew) who were devotes of Re-Horus and Hathor. Horus was regarded as the "Son: of Re who was conceived when Hathor was overshadowed by the Sun. The Sun was the emblem of the Creator. Hathor's animal totem was the long-horn cow and she is often shown wearing the horned crown, a solar cradle, which represents her divine appointment. This is why Hathor is shown in some Nile temples with her newborn in a stable or manger. 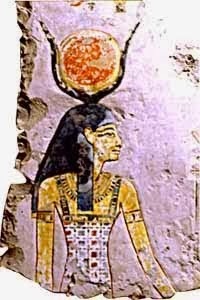 Hathor conceived Horus by divine overshadowing of the Sun, the emblem of Re. There are two ways to consider the parallel between Jesus and Horus: either Christianity absorbed ancient Egyptian mythology to explain Jesus or Jesus was recognized as Messiah by those who expected Him to fit the belief pattern of Abraham and his people. The second makes sense and fits the evidence of continuity from Abraham's faith to the Christian faith. It would be difficult to explain why Christians would adopt an ancient Egyptian myth centuries after the fact. Looking at the Re-Horus-Hathor narrative through the lens of anthropology one finds a tradition concerning the "Son" of God already developed among Abraham's cattle-herding Nilotic ancestors. 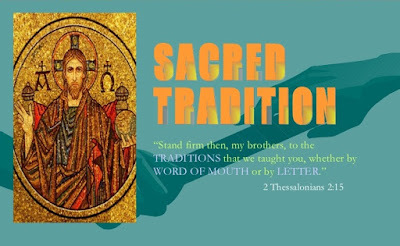 This indicates that this Tradition is received, not invented, and that it has specific features that the followers of Jesus Christ would immediately recognize. These features include expectation of the appearing of the Son of God by a miraculous birth under humble circumstances, His death and third-day resurrection, and His oneness with the Father. Could it also be said that Christ also wears a triple crown, representing the Father, Son and Holy Spirit; Abraham, Isaac and Jacob (Exodus 3:15); the three sons; His people, past, present and future; His reign over the spirit, soul and body of His people and the three Covenants, with Noah, Abraham and the final Covenant in Christ's blood? All true. You will remember that two wives in separate households consituted a single kingdom. In Scripture these wives are the mothers of three named sons. The three sons are a crown on the head of their father. They also represent the three sacred offices: Ruler, Priest and Prophet. I vote "Jesus was recognized as Messiah by those who expected Him to fit the belief pattern of Abraham and his people." Money, according to the Etymological dictionary, is from the word "Moneta", one of the names of Juno. But maybe Moneta could be derived from Mn? The regular shapes of honeycomb could be the inspiration for gold coins.